Since 2000, Sanijet Pipeless™ Technology has been the driving force behind the ultimate blend of powerful hydromassage, unmatched sanitation, and unrivaled peace and quiet. Our patented jets have provided homeowners, spas, salons, health care facilities and hospitality operators with the safest, most advanced spa bath and pedicure equipment in the world. 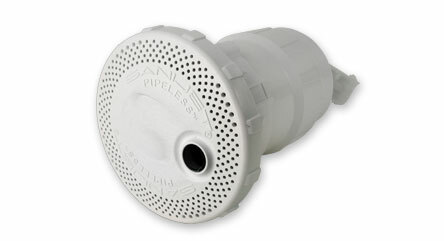 Sanijet Pipeless™ Technology eliminates the need for pipes and air channels that provide a breeding ground for harmful bacteria. And because each jet has an independent, whisper-quiet motor, our technology also eliminates the need for loud pumps and air blowers. What's more, our technology was developed over the course of seven years to achieve ideal water flow and maximize the health benefits of hydromassage. To provide credible, independent certification that whirlpool baths featuring Sanijet Pipeless™ Technology can be totally cleaned and disinfected, we submitted them to NSF International, a world-renowned, independent not-for-profit organization committed to public health and safety. NSF simulated exaggerated unsanitary bathing conditions for seven consecutive days. Each day, bath soaps, bath oils and five types of pathogenic microorganisms (Pseudomonas aeruginosa, Staphylococcus aureus, E. Coli, Candida albicans and Aspergillus fumigatus), along with a nutrient source for the microorganisms, were added to fresh water and circulated for 60 minutes before being drained. On the seventh day, our jets were hand-cleaned using an off-the-shelf, non-abrasive antibacterial cleaner (Lysol), rinsed, and sterile water was circulated for 5 minutes and then tested. The tests showed the baths were 99.9% hygienic, meeting complete Level II EPA disinfection under Protocol P182. As a result, spa baths equipped with our jets are the first and only certified for disinfection from NSF International.